Quite the oh well game tonight as the Sharks lost to the Buffalo Sabres 3-1. The Olympics are going on already, and the game just seemed pretty worthless. The Sharks played like it too. The defense was terrible tonight. Mistakes galore keying all three Sabres goals. Dan Boyle turned it over in his own zone a few times, and Rob Blake had some bad turnovers as well. The Sharks power play was disgustingly bad, not getting much opportunities at all. Again, this game was just blah. Too many other things going on to really put a lot of emotion into this one. The Sharks watched the opening ceremonies last night, so I’m sure that made the apathy worse for tonight. I don’t blame them. Hockey shouldn’t be played right now — NHL-wise. It should have ended by Friday. Kent Huskins was the lone Shark scorer. You know nobody cares when that happens. That’s all I have to say about the game. 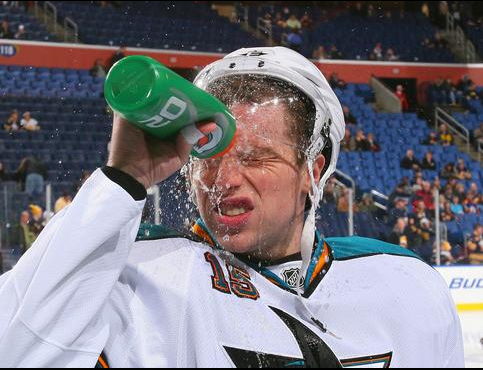 San Jose traded Jody Shelley to the Rangers for a 2011 conditional sixth round pick. I don’t see the point of this move. Well, I guess it’s to stop the Worcester shuttle. Shelley only made $725,000, so the moves are limited. But I was thinking maybe that was all that needed to be moved to make a bigger move after the Olympic break. Time will tell. I’ll miss Jody. He was a good guy and always had funny things to say. Hit-O-Meter: SJ 15 BUF 21; Niclas Wallin led with three. It’s break time! Two weeks of Olympics. Good luck to all the Olympians. I’ll be taking a break as well. See you guys in a fortnight.